We had a great time with you guys Thursday night after our timed run at Peter's Canyon. I thought the BBQ turned out great,even though the turkey and veggie burgers were slow cooking. :) Thanks to Keri's husband Mike (The Fireman), who finally got those coals burning! Yum! Everyone brought great stuff, and i cant wait til the next cookout to see what you guys bring. We have been updating the calendar on the website, please check it out for our next BBQ and runs.Click Here. A big Thank you to Jill, who came out to stretch you guys after your speedy work, Thank you Thank you! We love it when you come. This week for Peter's Group, we will meet at Cedars Grove Park at 6pm for a fun 45 minute run. We will surprise you with the route. 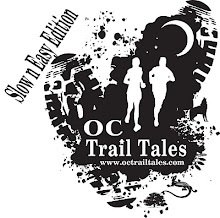 For our Longer distance trail runners, yes we are calling you...We will be doing a 10 mile loop at El Moro. Meet at Ridgepark at 6:30am Sunday the 3rd for our back in action/first time run/training for Mount Disappointment, Noble Canyon, Leona Valley Trail Series, Los Pinos, Griffith Park, and Chimera. Good Morning guys- Our Peters Canyon group really stepped it up last week on doing some hill work. Hope everyone is feeling loose and ready to take charge on our timed run this Thursday @6pm. We thought it would be a good idea to organize an informal BBQ POT LUCK for after the run. So if u are a former or future peep come on out we would like catch up and if thought about checking us out here is your chance. Feel free to bring the family there will be plenty to go around. PLEASE RSVP on this Blog Comments Section and write what you plan to bring. We will have Turkey Burgers, MAC n Cheese, and Drinks. O ya please arrive early parking has been a pain. We will get started with the timed run asap and grill while you guys are running... please bring something warm to wear for after the run. Where do we start? Everyone from our Peter's Canyon Group rocked! The weather was perfect and everyone turned in a remarkable results. A few of us left home with some extra goodies :) This week come prepared to run a few hills the schedule has us down for 30 but lets do 45min... next week we have another time trial run. So this week workout will get you ready. Yes the honeymoon is over. xoxo see everyone at 6pm. This past weekend we had quite the adventure in Big Bear. This is a must do event for everyone next year. Every year it sells out. Our Very own Sue celebrated her birthday with us. Happy Birthday! For Sue's Birthday we were able to go on a zipline tour. This was an amazing experience! Btw not only it was Sue's Birthday but it was also National Get Outdoors Day :) so we played. After our group dinner we still had a race to run. We all meet at 6:45am to head to the start. The weather was perfect! 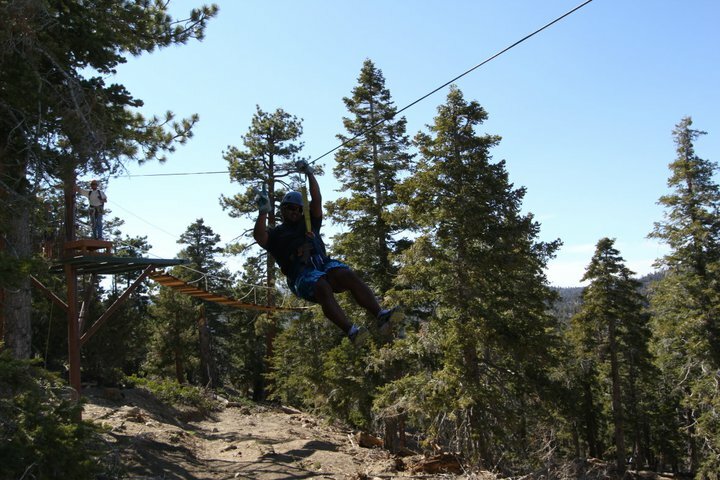 Everyone had a positive experience at Holcomb Valley Trail run. I hope more of you can join us next year. This weekend is Fathers Day so enjoy the time with family. We will be starting our longer trail runs in a few weeks for Mt. Disapointment, Nobel Canyon etc... if you are interested please respond to this email. We had an exciting week last week, and an exciting week ahead! Last Thursday for Peters Canyon Group, everyone did fantastic! We even went yet again another new way! I hope you all enjoyed it as much as we did. This week is your very first race, and for some of you, your very first trail race!! WHOA! You will all do Awesome! Please try to carpool if you can, and arrive early. Parking will be unbelievably horrible, and the school that they are using to have us park at is having graduation that same day, so please plan accordingly! :) We will have a booth, and you are more than welcome to leave your stuff with us while you race. If you have any questions before, please let us know so we can address them now. Sunday was fun! It has been about a year since my last Baldy trip, and I am so glad we got to go Sunday. You guys did awesome! I am sorry you did not get to experience going across Devils Backbone, but we still got altitude training, so all is good. Holcomb is this weekend, and I hope you guys are stoked! Everyone will do Awesome, and we can't wait for you guys to experience this fantastic race. Everyone from both groups should be resting this week. We know from experience there are some colds going around, and you should all just be taking it easy before your race's. No Wednesday night track, no speed work this week. Save it for your race! Sunday June 5th we will hike/run Mt Baldy. This is a great local Mt Climb to get ready for Holcomb the following weekend. Let's Meet @ 6:15am (sorry Sue) we anticipate this to be a good chunk of the day. Expect to back around 1pm ish... We will meet and carpool from Chevron (4710 Green River Rd Corona, CA 92880). Please RSVP your attendance. You will be required to carry at least 64oz of water, please bring a few cliff bars etc and camera for pictures. For our Peters Canyon Group this week we will run for 45min. please arrive early for good parking- another trail running group is also meeting at the same spot. Everyone from our group is doing awesome, last week everyone took the hills with authority. And it seems you guys like the mixture of trails options. We will keep with that theme this week thanks to Coach Corrinne. We will keep it fun and social. It was super hot, and way hilly! Idk about you guys, but i was a swollen hot red mess at the end. :) Awesome effort everyone!